The return to work. The setting of the alarm for the crack of dawn, the reminder of all the tasks you left unfinished before you left, the return of the Sunday night feeling of dread as the credits to Countryfile are rolling and you realise you haven’t even planned what you’re supposed to be doing tomorrow. As a teacher, the return to work comes several times a year; the return after Christmas, when it’s cold and grey, the return after Easter, when exams are almost upon us, and the return in September, when you are sure that you have forgotten entirely how to teach and surely you should still be on holiday somewhere exotic? What could be worse than each of these returns? The return after maternity leave, that’s what. It is now over a year since I returned to work after my maternity leave, and the trauma of the situation has faded into a distant memory. However, I recently discovered a draft post that I wrote long ago, back in the days before I went back to work and, having read a number of blog posts recently from people anxious about their own Returns, I thought I would resurrect it, for the benefit of anyone who thinks I might have even the tiniest pearl of wisdom to bestow. “And so the Day of Reckoning draws ever closer. The day I return to work, that is. 1.) Oh God, it is going to be really expensive. No getting around that one really, but at least I have basically learnt to survive on Absolutely No Money Ever, whilst on maternity leave, so it can’t be any worse than that, right? PIGLET IS GOING TO BE INSTITUTIONALISED. LIKE A ROMANIAN ORPHAN! What if he spends his days banging his head fruitlessly against the sides of a filth-encrusted cot, knowing only that he is abandoned? The thought of it makes me want to fling myself off the balcony. At least then he would be able to live with my mother, and she could retire. 3.) OK, so assuming that the above is not going to happen, and is just the wild imaginings of an overprotective parent (i.e, me), the third, and probably most important, pressing issue is WHAT IS HE GOING TO EAT ALL DAY? So far in two weeks of “eating” solids, all he has managed to do is lick a piece of bread, and while everyone else is banging on about their babies’ poos being so awful now, and full of broccoli and the like, Piglet’s poos have remained-if you’ll excuse the talk of bodily fluids, this is a baby blog after all-steadfastly liquid. So, over a year into the experience of being a working parent, what have I learned? What tiny snippets of experience can I pass on to the new generation of returners? 1.) It will be OK.
That’s it. It will be OK. They will survive. You will survive. Work might put you on the Get Out of This Place Ye Working Mother Before You Have Another Baby and Bankrupt Us duties, but on the bright side, that means you will have little work of substance to actually do, and might even be able to read novels all day, as I did after returning to my old job for three months before starting a new one (cheers work, and by the way, some of those novels were NOT suitable for the school library). You will also discover an efficiency you never knew you had. Entire blog posts will be written on the train, emails will be ignored unless they are life-threateningly important, and prioritising will be ruthless. You will be, quite literally, a machine. Your coffee habit will be insane. Oh, and the fears about them becoming a Romanian orphan are unfounded. That childminder/nursery will be absolutely fine. They will even look forward to going there. I know it’s hard to believe they will ever love someone that’s not you, but they will, and thank God. They might even eat something, although it may take a while. And trust me, enjoy those liquid poos while they last. It will be OK though. Honestly. *Good lord. Remember the Escape to the Country drinking game? Thank God I went back to work before I literally went insane. 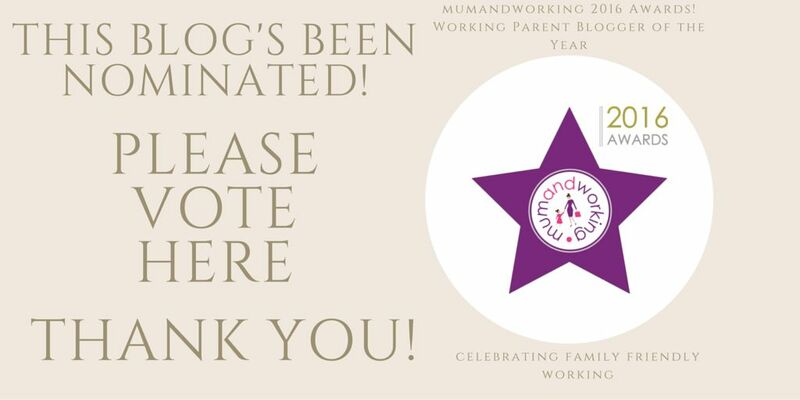 If you liked this post, or even if you didn’t, please feel free to vote for me in the Mum and Working Awards 2016. Next Post High Heels: Aren’t We Good Enough As We Are? Do it-I think we should have a tribesters Escape to the Country drinking sesh. Or just any excuse for a tipple really! Thanks for commenting and you’re right, it will be fine and you will manage. I feel for you on that one. When I was on maternity leave I was desperate to leave the house and had to make sure I got out at least once a day or I would literally go insane. I can’t stand staying in! That is so true, haha! Thanks for commenting. That’s interesting to hear about your husband, and fab that you managed to take shared parental leave. There are definitely benefits to working as well. Thanks Fi. Hopefully it will help put people’s minds at rest. I think we all have those fears, but it always turns out OK. I would be lying if I said I didn’t. That programme will forever be associated with maternity leave! I am going back to full time work soon – actually have to find work first before I can actually say to am going back to work. My Evelyn is going to nursery soon this September – but I am actually looking forward of going back to work. I like being with my kids – but it has literary been more than 5 years and I am a little rusty on everything – work wise. And yes, I am so scare of what the working world has for me. This post is a really good reminder that everything will be okay – and I know it will be – it is just that nervousness butterfly in your belly that’s all. Wow, 5 years. I would definitely be feeling a bit nervous after so long, but it will be OK, and nice to get back into it again I’m sure. Thanks for hosting and commenting. Three months of maternity leave is so short. I definitely feel for you on that one. Thanks for commenting. Certainly is. Piglet isn’t a great sleeper either (just got him to sleep at 9.30pm after nearly two hours of trying!) and it does wear you down sometimes, but every path has its advantages and disadvantages. You’re right – the most important thing is you WILL be ok (parents survive anything right!?) and your efficiency goes through the roof… I swear parents end up working harder than non-parents! Yes-getting out of the house is like a military operation! Good to hear. I keep telling myself that one day all these worries will be a distant memory. Looking back on it now, it was OK. Thanks for commenting. Thanks! Yes, luckily that one did prove unfounded. I was worried, but I think I was probably over estimating my own importance in Piglet’s life. I guess I am pretty important to him, but hopefully not so important that we need to be attached 24/7.